Spain’s culinary culture is as rich and varied as the country itself and one of the most popular dishes found here is Paella. There are many theories about the origin of this iconic Spanish dish; the first relates to its’ origin and the second has to do with the ingredients used in the cooking of the dish. 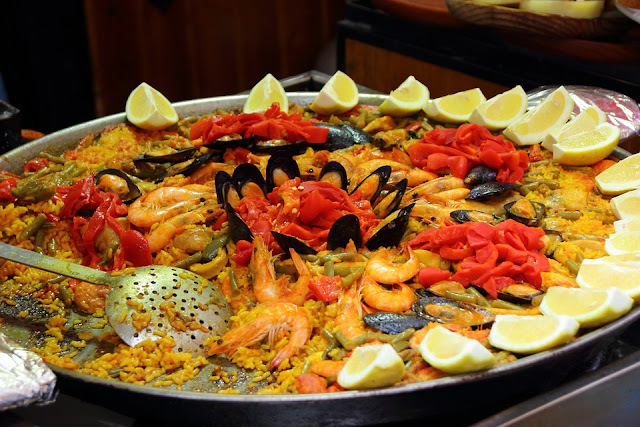 Simply put, Paella emerged in Valencia, Spain, in the area of the lagoons and marshes of the Albufera, where fresh water mingles with the water from the Mediterranean. Most restaurants throughout the world serve paella with seafood, which should be no surprise, considering the rich variety of seafood from the Mediterranean. What most people don’t know is that shrimp and squid were not part of the original recipe. Most people believe that the word Paella comes from the Old Valencian language and has its roots in the Latin word patella meaning pan. That said, there are several other theories out there about the origin of the word. The most romantic of them being that the dish was first prepared by a lover for his fiancee and that paella is a corruption of the word “para ella” meaning “for her”. There could be a speck of truth to this because today making paella is usually left to men! Others believe, that paella comes from the Arabic word “Baqiyah” meaning leftovers, pointing to the humble beginnings of this dish and its Arabic influence because the Moors brought rice to Spain. Today it is hard to separate Valencia from paella. 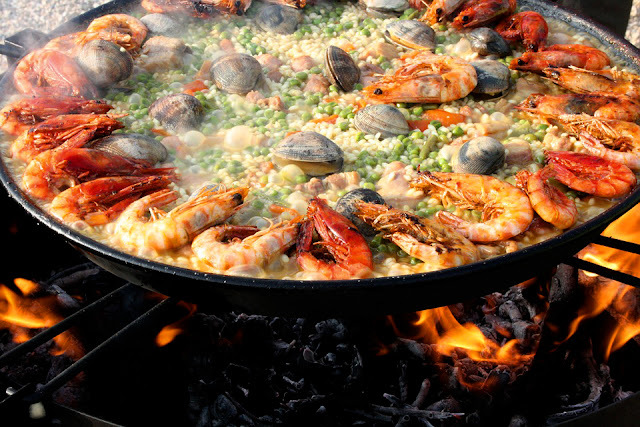 Paella emerged as a gastronomic delight in the 18th century and was cooked in a round flat pan that it was named after. The circular pan is made of polished steel, it is wide and not very deep with two handles on each side. Its flat and shallow design provides fast and uniform evaporation of the broth, an essential cooking technique for authentic paella. The recipe was dreamed up because of the introduction of short grain rice from Africa. The Moors conquered most of the Iberian peninsula during the 15th century and found that Valencia’s warm, dry climate was ideal to cultivate rice. In fact, paella is all about this short grained rice which splits the short way when heated rather than on the ends like other kinds of rice. This special short grained rice grown in Valencia allows it to absorb much more flavor from whatever it is cooked with. Paella was originally a peasant dish that was eaten by farmers and laborers. It was most often cooked by workers over a large fire made from orange tree branches for their lunchtime meal. Originally, it was made with whatever ingredients were on hand in the rice fields and countryside and, could include anything from tomatoes, onions, and snails; to rabbit, duck or chicken, with a dash of saffron for color and flavor and beans to add texture. Traditionally, each person ate right from the pan using a wooden spoon. 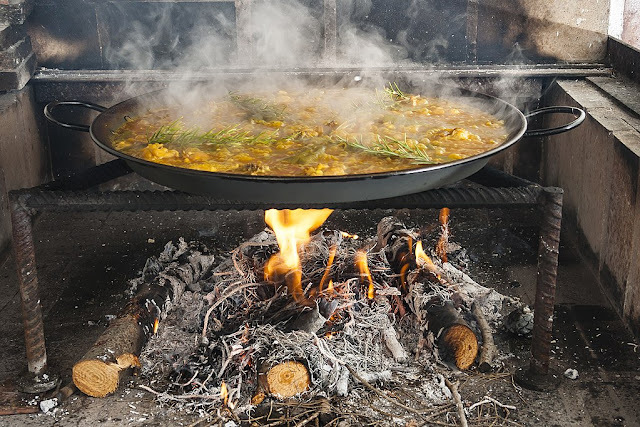 As Valencia rice became more available, paella recipes were shared and adapted with many new variations as this dish became popular throughout Spain and beyond. 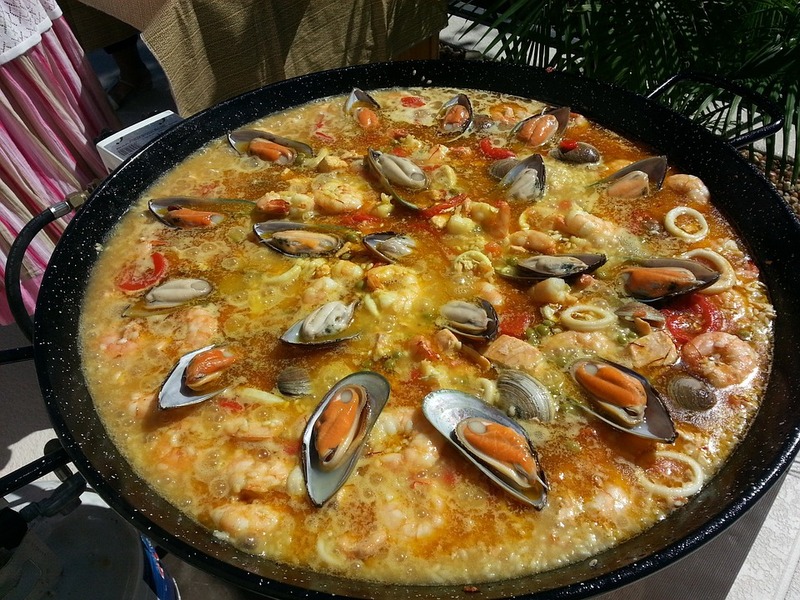 Today, a “true” Paella Valenciana is made with a mixture of chicken, rabbit, and snails with saffron and green beans and has no seafood, but most often, it is made with seafood including shrimp, clams and squid. Paella - Take Time to Enjoy! Food is a big part of Spanish culture, families use meals to socialize and meet at the end of the day. Many consider Paella as the National dish of Spain, that has as many variations as there are cooks! One thing every variation of paella has in common besides the rice and saffron is that it is a very social culinary occasion. Families congregate to eat paella not only in restaurants; but also at their homes, at mountain picnic sites and, on the beach. Making paella takes time and encourages conversation and celebration. For visitors, learning about paella and feasting on it is a highlight of any trip. Tours of Distinction is offering a small group ten-day trip to Spain, October 6-16, 2019, hitting all of the high points of this diverse and beautiful country. Cities that will be visited include Barcelona, Valencia, Granada, Cordoba, Toledo, Seville and Madrid. Special excursions planned include a bull farm experience, A Tapas Dinner, and Flamenco Show, and special tours of Llardi, known as the City of Porcelain, an Olive Farm and an Oil Mill Tour. 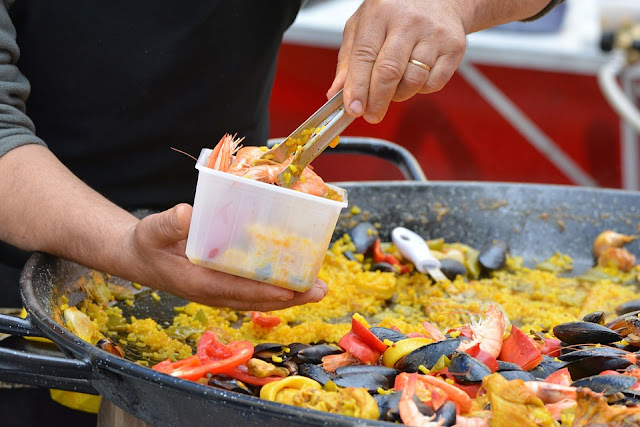 This tour also includes a canal cruise of the rice field plantations that surround Valencia as well as a cooking demonstration on how paella is made followed by an authentic paella lunch at an authentic fisherman’s home known as a “barraca”. For tour details click here.